Pythagoras starter – a revision of using Pythagoras’ theorem to find missing sides. 3 questions. Applying Pythag to a problem involving more than one right-angled triangle. Pythagoras and Spirals – a short presentation demonstrating how spirals are formed when joining right-angled triangles and the interesting pattern in the lengths of the hypotenuses when the short sides are all of length 1 unit. Basic Pythagoras questions – finding the missing sides given diagrams. Harder questions are included that involve more than one triangle joined together. 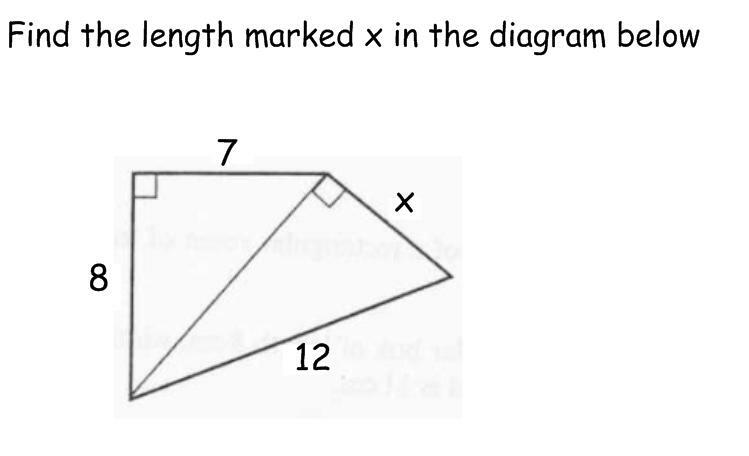 Applied Pythagoras – questions using Pythagoras’ theorem in a real-life context. An extension task on Pythagorean triplets is included. The Mathworld website has a number of excellent demonstrations of many mathematical concepts that can be played to pupils in class to enrich their understanding. You have to download their free Wolfram Mathematica Player in order to use these demos. But it’s quick and worth the effort. The demos below have worked successfully in the class room. You must have a valid Mymaths user name and password to be to use these links.